have asked us to create is here! What do you think would happen if, from the earliest days of childhood on, a person was constantly surrounded by and instructed in the most positive, empowering ideas and information the world had to offer? How might such an environment shape the course of that person’s life? How much of a difference, if any, would it make in his choices, decisions, actions and outcomes? It’s an interesting question, isn’t it? And as it happens, I have the answer. You see, day in and day out, I work with someone who is the product of just such an experience. Over the past fifteen years, I’ve come to know him professionally as well as personally, and I have witnessed first-hand the amazing effect that a lifetime of constant exposure to positive, self-actualizing ideas and people have had on him—and, in turn, on everyone who comes in contact with him. As a matter of fact, you also know this person. You’ve received letters and emails from him … perhaps even a phone call or two. But up until now, you may never have realized the remarkable depths of wisdom and understanding lurking on the other side of that signature. I’m writing to you today because I’d like to change that. The person I’m talking about is the one of the most respected and beloved Chairman in the entire publishing industry, he is Vic Conant. You know Vic as the Chairman of Nightingale-Conant. But he is also, without a doubt, the ultimate student of Nightingale-Conant’s programs. As the son of Lloyd Conant, co-founder of the Nightingale-Conant Corporation, Vic was literally raised on motivation. People like Dale Carnegie, W. Clement Stone, Norman Vincent Peale, and of course, Earl Nightingale, were regular guests at his home … the people he chatted with after school and listened to around the dinner table. And yes, Lloyd Conant really did have Nightingale-Conant programs piped throughout his house! Wherever you were and whatever you were doing, your mind was soaking up the foundational tenets of successful living. Once he took the reins of the company, Vic’s extraordinary education in the principles of successful living moved to a whole new level. He expanded the scope of Nightingale-Conant’s product library and guided the company toward the new millennium—while all the while remaining true to Lloyd and Earl’s founding vision. Vic’s remarkable upbringing engendered in him a passion for seeking out new ideas and innovative thinkers. It also gave him a razor-sharp ability to distinguish truly powerful concepts from weak imitations. But most importantly, it equipped him with a vast and astonishing arsenal of tools that have helped him in every circumstance and challenge along his life’s journey—as a student, a soldier, a husband and father, a business leader, and a pillar of the community. The insight and depth of knowledge Vic brings to every situation is astounding, whether it’s a critical brainstorming meeting, a number-crunching session, or a personal problem shared with him in his office. He never claims to know it all, and yet … he always seems to have a perfect understanding of what lies at the heart of the matter, and he is always able to pull out, from his vast storehouse of accumulated wisdom, exactly the right suggestion, strategy, or solution. Vic’s incredible wisdom and warmth are well known to those of us who work with him. He is the heart and soul of the company … a guiding light in so many ways. And it’s not just us. Over the years, countless customers have been surprised to receive a handwritten letter or personal call from Vic, responding to a question or concern they had, or simply saying “thanks” for their business and support. And many, many authors consider Vic not merely a business associate, but a close friend—something extremely rare in the often-cutthroat world of publishing. He is the ultimate example of someone who lifts up others as a result of having been lifted up himself. Yes, I want to learn the secrets of the ultimate success insider! A few years ago, Vic began to make occasional “guest appearances” on some of our programs, offering introductions to the authors and reflections on the material. Knowing Vic as well as we do, we knew listeners would love hearing from him. But quite honestly, we weren’t prepared for the overwhelming response his audio segments prompted. Almost immediately, I became inundated with calls, emails and letters from customers who had been touched, moved, or downright transformed by what Vic had to say. A full audio program — authored by Vic! Now, experience has taught me that when it comes to what programs we should offer, our customers rarely steer us wrong. And the more I thought about the idea, the more sense it made. After all, who better to deliver a program on how to live a successful life, than the man who has given more thought to the question, and encountered and absorbed more ideas about it, than just about anyone else on the planet? Vic has picked up and intimately examined every possible piece of the success puzzle. Thousands of ideas on how to live a happy, healthy, abundant, fulfilling life have come his way through the years — by hundreds and hundreds of authors from every point of view and place on the spectrum — and he has considered them all. I started to share the idea of a program by Vic with other members of the Nightingale-Conant team, and everyone went wild for it. We all knew the project had only one obstacle: Vic himself. One of Vic’s most endearing qualities is his profound humility. In fact, it’s precisely this quality that makes him such a great teacher and counselor. He considers himself a permanent student of personal development: in awe of the great ideas, never finished learning, growing and improving. Vic doesn’t hesitate to reveal his shortcomings and failures if there is a possibility that someone else could benefit from the lessons he has learned. And he’s always eager to acknowledge the role that others have played in his successes, never interested in taking credit himself for the many good things that have happened in his life. Given all of that, persuading Vic to step into the role of “author” was definitely going to be a tough sell. But I knew I had one ace up my sleeve. Vic’s customers are at the top of his priority list. Only his family ranks higher. So when he discovered how many customers had voiced their desire to hear more from him, he agreed at last to venture into the studio, open up his heart and mind, and offer his thoughts on what he has learned about achieving success and fulfillment in life. The uniquely wonderful and powerful program that resulted is called This I Believe: Timeless Lessons From the World’s Greatest Student of Successful Living. 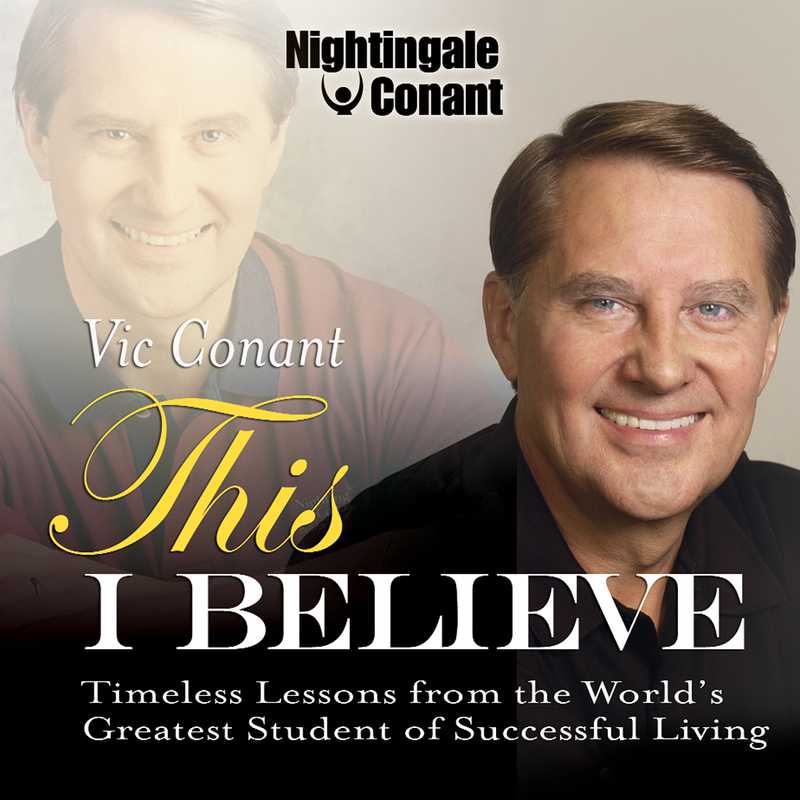 In it, Vic Conant shares insights culled from a lifetime spent in the company of the greatest success ideas, and the greatest practitioners of those ideas, the world has ever known. … and much, much more. Vic explores dozens of topics in This I Believe, including passion, confidence, change, character, marriage, health, genius, retirement, sales success, leadership, and teamwork. For each one, he offers a powerful, personal, straight-from-the-heart message that will undoubtedly connect to something in your own life … whether it’s the challenge of caring for ageing parents, the struggle to maintain health and high energy, the drive for wealth and professional achievement, the wonder of the changing world around us, or the simple joys to be found in everyday living. Successful living isn’t one dimensional. A person can be fantastically wealthy, but have terrible relationships … or have a wonderful family life, but a job they hate … or have a fulfilling career, but struggle constantly to make ends meet. With a 35-years-strong marriage, two terrific kids, a thriving business, rock-solid relationships that have stood the test of time, and an unshakably positive attitude that has carried him through good times and bad, Vic Conant is an example of a truly successful person. And it’s all thanks to the amazing information he has been exposed to, absorbed, and distilled through the course of his remarkable life. If that’s the kind of success you’re looking for, then you are going to find that the messages Vic shares in This I Believe incredibly meaningful and valuable—not to mention thoroughly entertaining. Find out for yourself what all of us here at Nightingale-Conant, and so many others, had already discovered: that the man who stands at them helm of the world’s greatest source of personal development information, is himself one of its greatest sources! Listen to the messages in This I Believe over and over, and you will realize that that they are among the most powerful you will ever hear. Why? Because each one bears the imprint of Vic Conant’s lifelong immersion in the greatest, most effective personal development information in the entire world. Vic doesn’t claim to be smarter, deeper, or more insightful than you or me. But what he does have that we don’t is a vast working knowledge of not just a few, but virtually all of the greatest ideas on how to create a successful and fulfilled life. This I Believe opens that arsenal of knowledge up to you. If you are truly committed to lifelong personal development, and you enjoy great stories that communicate timeless, universal truths, then you are going to absolutely love This I Believe. It’s a program unlike any you’ve heard before. I hope you’ll take this opportunity to get a uniquely warm and uncommonly wise perspective on the hows and whys of successful living. Timeless Lessons From the World’s Greatest Student of Successful Living. I want to learn the secrets of the ultimate success insider! This I Believe, at the special price below and if I order now I will recieve The Strangest Secret for Succeeding in the World Today for FREE. - I can select one of two ways of ordering. Often referred to as the "dean of personal development" Earl Nightingale probably knew more about success in life than anyone else in the world. He was a master motivator, a Renaissance man, who absorbed and digested the most profound thoughts of the world's greatest minds and presented them in clear, easily applied instructions. Over a career that spanned more than four decades, he developed a syllabus for success that has never been equaled. His famous message upon which this book is based, The Strangest Secret, earned the first Gold Record for spoken word, with sales exceeding one million copies. It tapped into what was subsequently discovered to be a groundswell demand for recorded, informational messages and was the precursor of the spoken-word audio cassette industry. The classic message is as timely today as it was when first published in 1957. 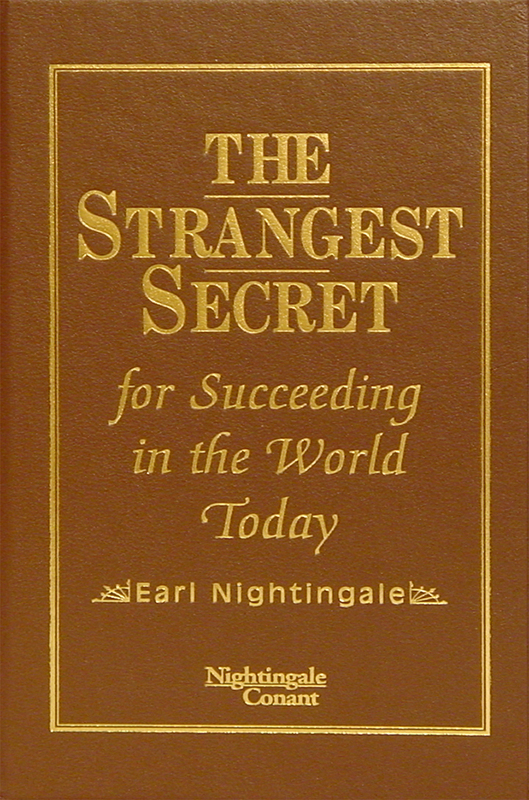 In it, Earl Nightingale reveals how he discovered and lived the strangest secret of success. We invite you to learn and apply this secret in your own life and enjoy the extraordinary rewards of excellence.